Apple's not patching 10.3.9 any more, but this is pretty bad. Deleting a new, untitled folder without first renaming it (in column view) may inadvertently move the parent folder to the Trash under certain circumstances. 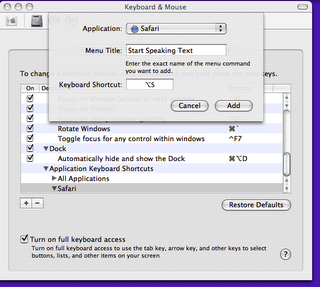 This article applies to Mac OS X 10.2 through 10.3.9. Flock is interesting. It's a "web 2.0" application built around the firefox/mozilla rendering engine. Open source. Tied to a variety of blogging services, photo sharing, etc. It bugs me that they're hiding their business model, I assume it's somehow tied to selling integration into other services. There are versions for OS X and XP, including built-in blogging tools that cover Blogger. I'm going to try it on OS X for Blogger work. It has lots of memory leaks and performance bugs (like Firefox) though, so I'm mostly intereted in the version that will come out with the Firefox 2.0 engine. I've never seen a product get 15 five star reviews over the course of more than a year. I'm tempted to buy it just to find something to complain about. It includes Adobe Acrobat Standard in the price. Very impressive scanner. I wonder how it would do with a stack of 4x6 prints? I wouldn't expect any prizes, but I'm curious. This post was very interesting -- only one I could find. It sounds like me. A high speed scan of lots of prints, then f/u with a high quality negative scan of the good ones. Update 10/1/06: I eventually figured out the problem with the ScanSnap. It needs an attached computer. What I want is a scanner that sends the image to a file share, no computer required. I'd like a web interface to configure it. Wireless of course. OmniPlan Coming Soon! The beta is Wednesday. Our family is interested, especially if there's iCal integration. More soon. I added their blog my bloglines. 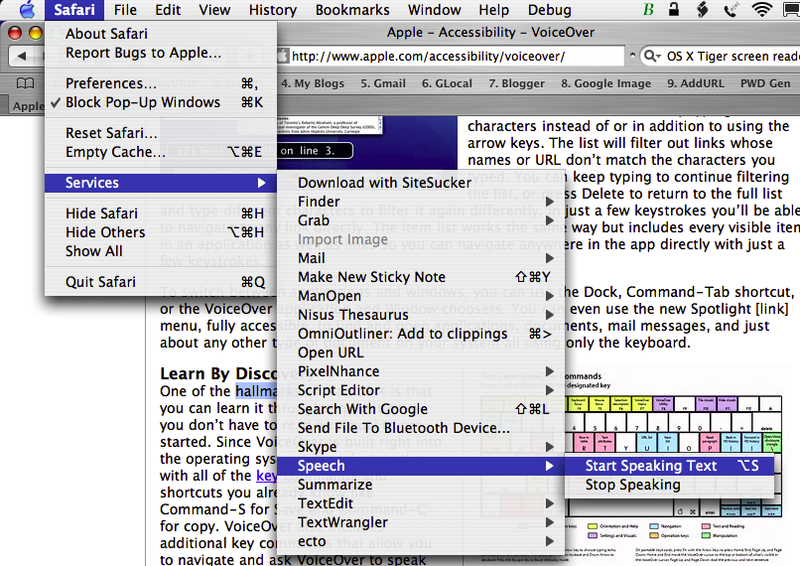 The trick is to assign a keyboard shortcut to the OS X 10.3 (or 10.4) speech service. 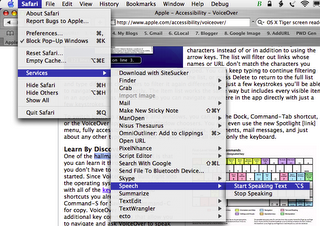 Now when I highlight a work and type Option-S in Safari, OS X speaks it. Even works on my old iBook running 10.3. Of course Tiger users might try VoiceOver, but it's pretty heavy duty. The method for keyboard assignment is pretty kludgy, but easy after you do one. I've had five Canon digitals: the tough-as-nails S230, the reasonably robust s410 (though the rotary settings dial failed there, happily I had the AMEX extended warranty), the ultra-rugged G2 and the excellent Digital Rebel XT. Oh, and the brand new frail and feeble Canon PowerShot SD600. Oh, it's not a terrible camera. It's inexpensive, the images aren't worse than the s410, the shutter lag is somewhat less ... but I expected more. Yes it's smaller -- but only outside of the case. Put it inside the somewhat bulky case (you wouldn't want this fragile toy any other way) and it's about the same size as the s410 in its case. So the size drop doesn't bring much practical value, but the large display and small size have some unfortunate side-effects. The flash is microscopic and the battery is too tiny to power the big display for long. Speaking of the big display, it doesn't leave much room for the almost invisible controls. Yes, the display is nice for doing on camera image review and editing, but we do that on the 20" iMac display. It's made for consumers who don't use a computer. Maybe it was the lack of space that made Canon remove the mechanical switch between 'Auto' and 'Manual' settings. That hurts. My wife uses auto, I use manual. The switch used to be foolproof, now it requires quirky menu navigation. And so we come back to the build quality. On the one hand the camera has a one year warranty. On the other hand it probably doesn't cover the camera door coming off in your hands. This camera is 'Made in Japan', but evidently that doesn't mean what it once did. The first time I inserted the SD card it wouldn't pop out again, though it did on a second try. The Digital Elph's had an enviable reputation for solid construction, Canon has tossed that out the window. If I were Canon's CEO I'd be calling for an internal inquiry. A few positives to end with. It still uses a standard mini-B USB connector and Canon's compact and plugless wall charger is as well designed as ever. For the price it may still be a competitive offering, but in the past I used to tell friends to save their time and buy Canon. Now I have to tell them to look around first. Google has begun selling hardware to support some their software products. An interesting development! Apple seems not to have given up on Automator (though I expect them to replace AppleScript with 10.5. Automator World is a good source of ideas an actions to add to Apple's limited starter set. I've added there RSS feed to my bloglines collection. The trouble with most software news sites is that they're biased to the newest fashion. Older, mature apps get no credit. LaunchBar, my all time favorite, isn't free and it's updated with care -- so it doesn't get much attention. The G5 iMac screen cannot be turned off without putting the machine to sleep. My automated backups don't work when the machine is asleep. The light from the iMac, even at the lowest brightness session, illuminates my daughter's room. We can't shut the door because the air conditioner is in the computer room. A conundrum. Others have variations of this. One approach is to use a single black pixel as a screen saver, then tile it (Mac OSX Hints). I like my photo screensaver though, and switching screensavers night and day is a nuisance. Brightness Control is great, but the screen is not all that dark, and I think when the screensaver (photo show) turns on BC turns off. Apple should have done something about this (hmpphh), but doubt they'll bother with it for their older machines. Update 8/11/2007: Dockables screen sleep puts my iMac screen to sleep! I didn't think that was possible. 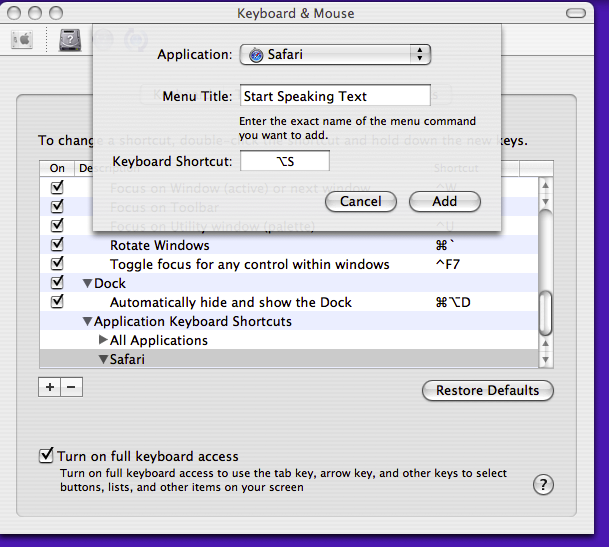 Update 5/22/2009: In 10.5 (Leopard) Apple added an undocumented screen off shortcut key. It's killing Safari! If you like that browser, help with ... Mac Attack the Minneapolis Star Tribune! I put an SD card (1GB, $30, ridiculous price drops in the past year) into my son's neglected VCamNow (sold via Target and Amazon). Then I put it in "play" mode and connected it to my iMac. I was pleased to discover that the camera mounted and I could edit the jpg photos and AVI movies in iPhoto and iMovie. My son was delighted and the camera is now quite popular. I noted my discovery in an Amazon review, then decided to ask Google if anyone else had noticed this. Not many it turned out, but one kindred spirit made the same discovery last December. Now there are two postings, so anyone who cares will find the answer to their worries. My unsuspecting collaborator notes the bundled software (PC only) is quite horrid, but the software is not needed on XP anyway. There's no Mac software, so one must make do with iMovie and iPhoto :-). He notes the Mattel Vidster (not as good) also works with OS X.
Update 9/16/06: I think for this to work you have to first play a piece of one of the movies, and it may only work if you use the internal memory card to store data on. I think playing a part of one movie in the camera causes it to build a file system of some sort. Otherwise when you mount the camera the folder is empty. Also, here's info on the AVI format..
Update 10/15/06: iPhoto 6 will mount the VCamNow and import the videos. At last, a use for Automator! I might conceivably use this one. I have a Brother MFC I like, but it's gray scale. I'd set this to use my ink jet instead. Bagelturf is a "low end" (G5 iMac) Aperture user took his blog postings and reorganized them into a topical view topical view. I love the reuse and refactoring aspect of this, but I'm particularly interested because his configuration is similar to my setup. Tidbits channels Guy Noir in The Mystery of the Burnt Thighs. These MacBook Pros may have been overheating due to a bug in OS X SMB services. I had a similar heating problem with my iMac due to a buggy Canon print driver. A stuck print job pegged the CPU and just about cooked the iMac. If my iBook holds up I'll wait for rev. B of the MacBook. I'm not interested in the MacBook Pro. Update 9/3/09: Many years later Canon printer drivers are still driving OS X users mad and Canon scanner drivers are no better. Don't buy Canon hardware. Fascinating. Microsoft is offering Office 2007 to play with -- using Citrix. How far away can a Citrix acquisition be? Is this anyting more than a marketing gimmick? It's way, way, past time that OS X implements a thin client solution -- this is the way most productivity applications should be deployed in the home. It needs to be built into 10.5 as Windows Remote Desktop (shares some heritage with Citrix I think) is build into XP Pro. A good set of links in here: Arms race in the [airfare] market: Dynamic vs. predictive pricing. now does Korean to English and vise versa. That's new and noteworthy! Firefox running in XP won't render the Korean output, I'll try on a Mac.